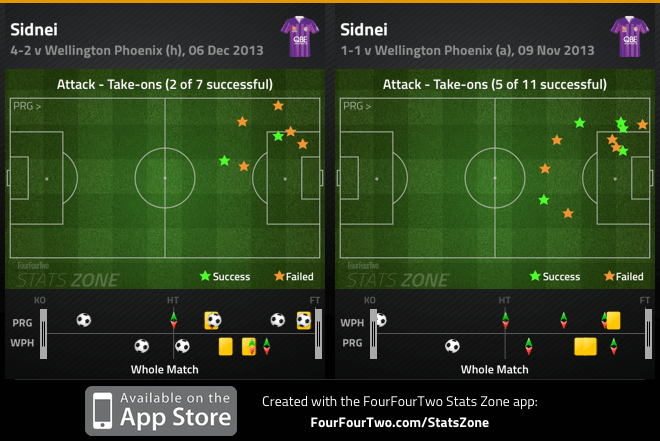 Wellington turned things around after Sidnei’s screamer, but Perth replied with three unanswered goals. Alistair Edwards has had to deal with a remarkable number of enforced injuries, suspensions and departures (with Steve Pantelidis off to Malaysia) – he switched to 4-3-3 after last week’s experimentation with 3-4-1-2, and brought Danny De Silva and Chris Harold into the side, after losing Shane Smeltz and Ryo Nagai to injury. Ernie Merrick made three changes from last week’s 0-0 draw with Western Sydney, with Reece Caira, Paul Ifil and Jeremy Brockie starting in what was a fairly attacking 4-2-3-1 formation that could have also been described as 4-2-4. The nature of the players meant the front four could have been in any format, but broadly speaking, it was Kenny Cunningham left, Ifil right and Stein Huysegems playing off Jeremy Brockie. Whatever Merrick intended it as, Vince Lia and Albert Riera were clearly a midfield duo, sitting deeper behind the attacking quartet. 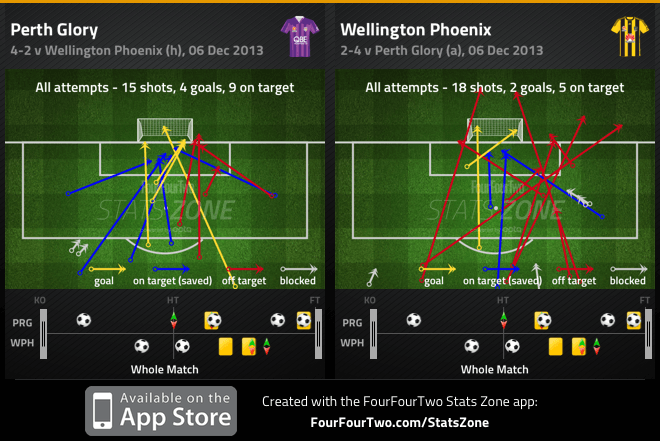 This was a key feature – Wellington appeared extremely open in that zone, and Perth frequently found space to create chances. There was a Jamie MacLaren shot deflected in the ninth minute, then Sidnei’s dive inside the penalty box, and the Brazilian’s spectacular goal, which came from him driving into a pocket of space behind Riera. All these chances came when the ball was played beyond Wellington’s first line of defence – the front four – which in turn forced the two midfielders forward to close down the ball carrier, creating space in behind them. Perth, however, had their own troubles in a similar zone, which can largely be attributed to the absence of Jacob Burns through suspension, who normally protects that space in front of the defence keenly. However, the change in formation was also very important (not the 3-4-1-2, but the switch away from 4-2-3-1) because that naturally creates a “double pivot” shield. Here, the two advanced in the triangle, Ryan Edwards and De Silva, who would both probably be more comfortable in a 1-2 triangle (like in a 4-2-3-1), were often slack with their defensive discipline, creating space on either side of the lone holder, Steven McGarry. There was one moment in particular where Edwards gave the ball away, and made no effort to get back behind the ball, symptomatic of his and De Silva’s lack of intensity. As a result of this space between the lines, lots of the chances were shots from range, and the first two goals came from outside the box. 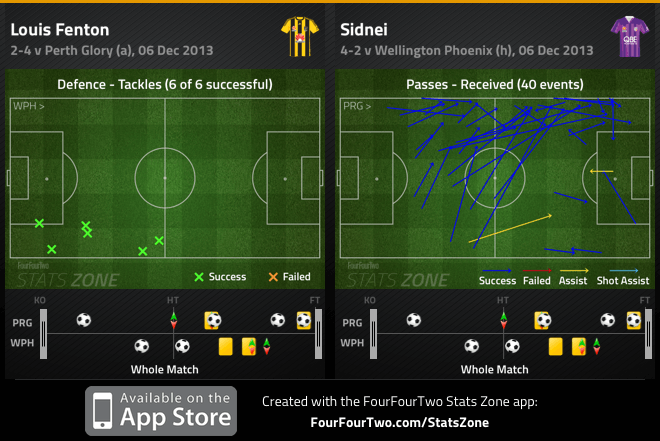 It was fitting that Sidnei scored the opener, seeing as he was the most dangerous player of the opening period. It was reminsicient of the reverse fixture between these two sides, when Sidnei repeatedly beat Phoenix right-back Louie Fenton in 1v1s, eventually creating the first goal of that game. Here, he again found space to attack the redeployed youngster down the left touchline, driving past him twice in quick succession early on. However, the fact Fenton’s now had several weeks in the new position – rather than one, as was the case back in November – was important, and he coped far better with the Brazilian’s powerful dribbling. Still, despite Fenton’s fine tackling statistics, it was significant that Sidnei was so constantly in space – it helped build pressure. The third main feature of the opening period was both sides getting caught out with their ambition to play out from the back. As discussed previously, the appointment of both coaches to these clubs was partly because they wanted to progress the team towards more positive, proactive systems, and they nearly always looked to start passing moves from deep positions. However, both Perth and Wellington had trouble in the transition between defending and possession (Opposition Ball Possession to Ball Possession, for those who’ve undertaken the FFA Coaching Courses), and although no goals stemmed from it, both became remarkably stretched at certain points – on one occasion, Michael Thwaite, Jack Clisby and Danny Vukovic all attempted incredibly risky passes inside the penalty box in an attempt to retain possession. A good example of this issue was when Cunningham hit straight at the keeper after Ifil had robbed McGarry of possession just outside the centre circle, while Perth had lots of half-chances from quick breaks from around the halfway line, including Harold’s clever fake to create a close-range shot he squandered by hitting straight at Glen Moss. Merrick said post-match the opening half hour was the worst his side have played this season, but to his credit, his tweak of the formation at that point helped turn things round. It’s something he’s done quite well this season, like when the introduction of Jason Hicks midway through the first half helped them grab a point away to Western Sydney, although it inevitably raises the question of why he isn’t getting it right from the start. 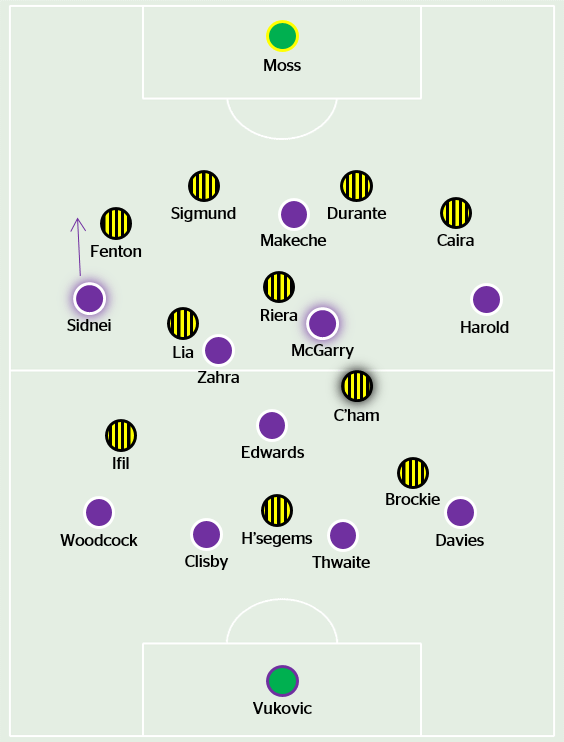 The tweak here was practically the same move as in that aforementioned match against the Wanderers, where he withdrew one of the forwards into the midfield zone, effectively warping the shape towards 4-3-3, which incidentally has been the other predominant formation Merrick’s favoured this season. 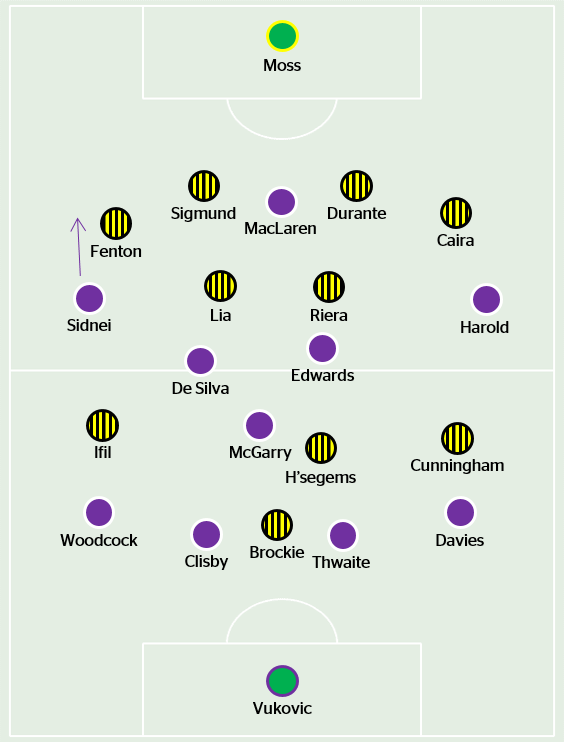 Surprisingly, though, Merrick chose to pull Kenny Cunningham back – the Costa Rican seems too ‘attacking’ to fit into a midfield role, and in fact, it was Cunningham’s poor defensive discipline against the Wanderers that forced Merrick into a formation change back then. However, having started with four out-and-out attackers, Merrick was clearly hampered by a lack of options, and being behind at this point of the game, he wouldn’t have wanted to hamper his side’s attacking options. Now, the Phoenix had three players occupying that central zone, and the momentum changed almost immediately. Having an extra passing option through midfield was important, as it in turn allowed Brockie, Ifil and Huysegems to sit slightly higher up the pitch, and there was now also an extra player behind the ball at transitions – there was one particular moment around the thirty-five minute mark where this proved very important. Huysegems scored a wonderful curling effort before the break to equalise, and Ifil gave his side the lead just after the interval with a header from close range. Edwards made a change at half-time that he explained later as a fitness concern, withdrawing the young De Silva (who did look fatigued towards the end of the first period) and sending on Cameron Edwards, so now the two facing forward in the midfield triangle were both the coach’s sons – one of the more unlikely things you’ll see in professional football. The three major themes of the first half (space between the lines, trouble playing out and quick breaks) were again significant in the second – Sidnei again was clearly the game’s most dangerous player. He drew a yellow card from Fenton with an excellent burst of pace and drove into shooting positions down the left flank (occasionally swapping over to the right as well), going close with a low drive across the face of goal. His set piece delivery was also very good, whipping in two good crosses from the right hand side. Michael Thwaite scored Perth’s equaliser from the latter. The key moment, though, came with Edwards’ bold double change at the hour mark, as he pulled off (Ryan) Edwards and Maclaren, and introduced Adrian Zahra and Ndumba Makeche. He also switched the roles of (Cameron) Edwards and McGarry, so that the former became the deepest player in the triangle, and McGarry was now the advanced right-of-centre midfielder. It would be simplistic to then attribute Perth’s third goal to this – when McGarry drove forward powerfully on the ball into the penalty area – and in truth this was an isolated event rather than a tactical masterstroke that you can credit to Edwards. The fact the two substitutes combined for the third (Zahra providing the finish after McGarry’s initial effort was blocked) was merely circumstantial, although Edwards deserves credit for his adventurous substitutions, gambling with two attacking changes even with half an hour still to play. Unfortunately for Merrick, he’d used up all his subs before Perth took the lead, having replaced Ifil and Cunningham with Jason Hicks and Leo Bertos respectively, which made the side more ‘natural’ on paper. Having gone behind, Phoenix pushed their players forward once more in the final moments, and Sidnei scored a fortunate goal on the break. Lots of things to discuss here – Sidnei was constantly dangerous throughout the match, and finished with two goals and a fine assist. Fenton coped with him far better than in the previous fixture between these two sides, but the problem was how frequently he had to deal with the Brazilian, and Perth constantly built pressure through his powerful on-the-ball running. Edwards’ bold substitutions added to the impetus, and overall, there was an exciting, open feel to this match. Similarly, Merrick went for it from the start with his attacking line-up, but that effectively meant he had to be very reactive for the rest of the match – his side never really got on the front foot, and he’s yet to really find the right balance between his favoured formations, eventually using both them over the course of this match.